Business press announcements during this past year highlighted a familiar trend. In 2005, just as in recent decades, companies were firing their ad agencies in order to choose new partners. For example, in August, Sears terminated its 43-year relationship with Ogilvy. Less than a month later, Bank of America ended its three-year association with McCann Erickson. Not to be outdone, Washington Mutual moved its advertising to Leo Burnett USA, and Volkswagen ended its ad partnership to quickly establish a new one with the agency that helped launch the Mini Cooper in the United States. The beat goes on. Companies make these changes in pursuit of what's often called "fresh thinking" or "new ideas." Marketers are seeking to alter their message -- or at least the manner in which it's being delivered. When business softens and times are tough -- and investors or franchise owners start making a lot of noise -- many companies conclude that it's time for them to present a new face to the customer. In crafting that new image, however, companies typically focus on the external world. They take a walk outside the organization to see how they look through the eyes of the prospects and customers they hope to entice. But too often, they overlook an audience that is actually every bit as important as the external one: the employees who must "live" the brand every day. The impact of brand communications on a company's external audience is easy to see. A company's fortunes rise and fall according to the numbers of customers it attracts and manages to keep. But the impact of brand messages on an internal audience is less obvious, or perhaps less immediate. After all, for most companies, the first priority is to get the company's message right, and get it "out." But that's the wrong first step. In seeking to put forward a fresh face, companies should first look at that "inside" audience. While advertising is typically looked upon (and funded) for its external marketing contribution, there are critical internal roles for a company's message as well. Moreover, the inside audience needs to be considered throughout the process -- from the formulation of the company's message throughout the campaigns set up to communicate that message. Too often, employees are grudgingly considered only after the message has been developed and executed. They are simply gathered into dark rooms so that they might appropriately "ooh" and "aah" when shown the company's latest ad campaign. But that's too late, and it ignores the crucial role that employees play in defining and refining the brand promise. There are four important reasons why companies need to assess and address their employee audiences. 1. Employees must keep the company's brand promise. Employees represent the company's ability to fulfill its brand promise. They're an essential ingredient, enabling the company to credibly support the message it sends to customers. There can be no meaningful customer covenant without the strong support of the company's frontline human assets. Whether the brand promise is "We try harder," "Ready when you are," or "When it absolutely, positively, has to get there overnight," company promises require company performance. And, in today's service economy, performance requires people. Gallup research shows that if a company wants to harness the power of its workforce, its employees must have a crystal-clear understanding of exactly what the company expects from each of them. (See "The First Element of Great Managing" in the "See Also" area on this page.) Employees represent an enabling -- or limiting -- factor that determines the company's ability to perform to a high standard. The company's brand message can help employees understand what customers expect from them; it can also help galvanize and energize employees and elevate their performance. But employees can't be expected to embrace and live a brand promise they haven't heard or can't articulate, or one with unclear implications for employee action. Employees shouldn't be an afterthought; they're the foundation of a company's brand delivery mechanism and an essential audience for company communications. 2. Employees can attract and retain customers. Employees don't just live at work; they regularly interact with their relatives, friends, and neighbors. They provide a powerfully credible, albeit often indirect, human message from the company to the wide world in ways that either support or contradict the company's stated slogans. They can build and support strong platforms for customer relationships. But employees can't serve as strong supporters of a brand message they neither know nor understand. 3. Employees can generate support for company initiatives. Employees are members of many different communities. Their support and enthusiasm for their company's plans and programs can have a huge impact -- one that may be felt from the local town council to the state and national legislatures. Employees can serve both as emblems and ambassadors of the company's community commitment. And they can play a vital role when companies are seeking to expand operations or lobby for the reduction of cumbersome regulation. Again, however, they can't endorse or support company programs if they're uninvolved and uninformed. 4. Employees recruit other employees. Beyond their roles in providing word-of-mouth marketing and community-building activities, employees can also help attract and retain talent. Employees represent the front lines in the war for talent, a struggle already well underway in many industries. Employee comments can be far more influential than the company's recruitment ads, and their commitment -- or lack thereof -- is contagious. As companies enlist new communications partners, hoping somehow to elevate their message, they carefully consider their external audiences. They begin by assessing the potential of their brand promise to create bonds with consumers. They pre-test their appeals and track the impact of their messages. They know that their ad campaigns must connect with consumers or their ad money is wasted. But what about the internal audience? The same requirements should apply. New promises should be examined not just for their power to attract consumers but for their ability to galvanize employees. That new ad campaign not only needs to emotionally connect with a company's consumers, it needs to emotionally connect with its employees. If employees don't understand and embrace the company's message, the company's promises will likely go unfulfilled. Company communications can serve to refresh, refocus, and reinforce the brand -- and energize and empower a potent human army of marketplace and community emissaries -- but only if the company's message is credible, compelling, and able to personally connect with consumers and employees. Companies can ignore their internal audience -- but that's as short-sighted as ignoring the external one. 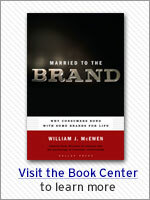 William J. McEwen, Ph.D., is the author of Married to the Brand. Gallup has found that employees often feel disconnected from the brands they're asked to represent. They also have little knowledge of -- or enthusiasm for -- what it takes to transform customer transactions into enduring relationships. Making sure employees know what's expected of them at work is the foundation of management. Supported by decades of Gallup research, the authors of 12: The Elements of Great Managing explain why. A recent GlaxoSmithKline decision took the advertising industry by storm: The pharmaceutical giant enlisted its 8,000 U.S. sales representatives to act as "public relations ambassadors." The company hopes that the reps will help to counteract negative images of the pharma industry. Will other companies (including yours) follow their lead? Does Your Brand Attract Star Employees? Many star employees are open to new job opportunities. Companies are doing a poor job of wooing them.